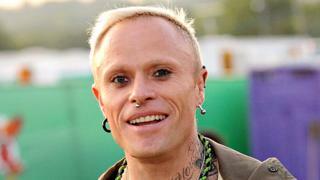 Fans of The Prodigy have travelled from abroad to pay tribute to frontman Keith Flint. Well-wishers from Australia, Germany and the Netherlands were among those arriving in Braintree, Essex, before a funeral procession through the town. Floral tributes from America were also placed outside St Mary's Church in Bocking, where the musician was laid to rest at about 16:00 GMT. Essex Police said it was expecting "a large number of well-wishers" to line the streets after Flint's bandmates called on fans to "raise the roof for Keef". Before the ceremony began, fans of the band began to gather to pay their respects. Prodigy superfan Araks Azarian, 36, jetted in from Australia to be part of the funeral procession. The 36-year-old, who arrived in the UK earlier, said she had been flying around the world "for years to see the boys". "This is going to be my last chance to do it." Marie Lelicova, 25, travelled from Prague to remember Flint, whom she said she had "loved since she was a child". "He is part of my life," she said. "He is the person who showed me the way to live. I wanted to say goodbye and say thank you." 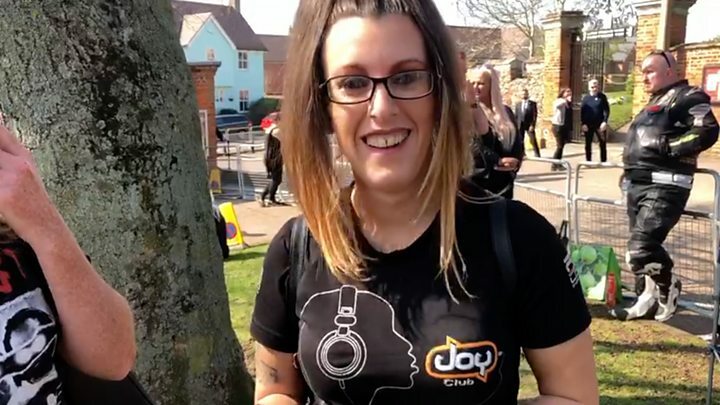 Braintree resident Rachel Moore said she had "grown up" listening to The Prodigy and said the band had "put Braintree on the map". "They made us proud of where we came from," she said. "Their music underlined our upbringing." Her sentiments were echoed by staff at Scallywags Day Nursery in the town, whose children had made a touching tribute to Flint that hung in the window. Image caption Rachel Moore said she felt The Prodigy had "put Braintree on the map"
Image caption A Braintree nursery also paid tribute to the town's famous "Firestarter"
Rob Reilly, manager of The Leather Bottle pub in Pleshey - which Flint used to run - said the musician's Firestarter ale had been put back on tap as a tribute to him. Another Braintree local Gary Dring, 35, attended the funeral procession in the boiler suit Flint wore in the 1992 Outer Space video. Describing him as "a legend", Mr Dring said Flint was "one of my all-time heroes" and he had been "gutted" to hear of his death. "Growing up listening to his music got me through good and bad times," he said. "It's like losing a mate but that's why we're here today, to give him a good send-off." Image caption Braintree local Gary Dring, 35, said Flint was "a legend"
Essex Police has urged residents "to be mindful of potential delays" on the roads. The procession is due to arrive at the church at 15:30 when a service will be held for family and close friends. Local schools closed from midday to allow pupils and parents to escape the anticipated traffic chaos. Essex Police force said: "The roads will not be closed throughout the course of the procession so as such, we would ask drivers to avoid the area and find alternate routes where possible. "The church service at St Mary's will be for family and close friends of Mr Flint. "Fans and members of the public are asked to respect the privacy of Mr Flint's loved ones during this difficult time."